Earlier this week I spent the day with Gary, an old friend and travelling companion. He gave me what he described as “A dancing skeleton“, a 9cm plastic jointed marionette that was part of a Day of The Dead hoard we’d collected while in Mexico City and Oaxaca State in October and November 1993. 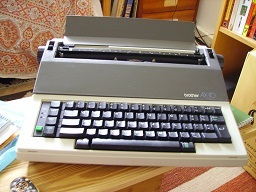 I recently acquired a lovely late 1980’s electric typewriter. A Brother AX-10 , all for a fiver, with ribbon and erasure tape easily available online. I bought the typewriter, not in a pique of retro-inspired luddite-ism, but to shake up my writing process and to accommodate my lack of a printer for my laptop. For many years my usual writing method has been to start writing longhand, drawing from notes, scraps of paper and innumerable notebooks that I carry, keep and plunder. When I feel a writing project coming on, I gather together the longhand notes and begin reworking and writing them up in different colour pens on plain sheets of A4, I work and fiddle with them until the whole is practically illegible. At the point of illegibility I type what I can decipher into a word processor (desktop or laptop) and print off a hardcopy, which I, again, rework in different colour pens until it’s illegibility forces me to stop and use it to re-edit the document in the word processor. I call this my “first draft” and it forms the basis of all subsequent re-writes, obviously culminating in a final finished draft. Being without a printer I have often found myself floundering , I find working directly onto a computer distracting and frequently unproductive – notes that flourish under the coloured pens often look like dead gibberish on the plain flat screen. With my new 1980’s typewriter I can type up the notes from the first run of coloured pens giving me a clean legible hard copy to work with the coloured pens a second time – only typing into the word processor to produce the “first draft”. This is how I am writing this piece – at the moment I am copying from a virtually incoherent multi-coloured manually typed sheet – inputting it as a “first draft” into my laptop and hoping that I don’t lose this particular sentence in the re-edits! But there is more of co-incidence and strangeness about this typewriter – the truth is the Brother AX-10 is an old-time dream machine of mine. Back in the late 1980’s my parents offered to buy me an electric typewriter. 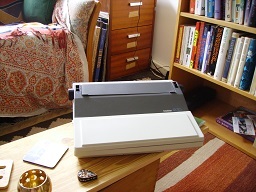 Up til that point I’d been taking my writing aspirations out on a typewriter borrowed from an ex-boyfriend – an incredibly compact (that is dense and heavy) pale-blue portable Ollivetti – very mechanical, very physically demanding. I pounded on the Ollivetti in my parents spare room over the summer break, then I went back to college, taking the Ollivetti with me. At the impending approach of the christmas break my parents suggested I leave the Ollivetti behind – they had been driven to buy me a modern light-touch electric portable. Needless to say I researched the subject of electric portable typewriters profoundly. A task of inconceivable complexity and physical legwork in those pre-internet days, it involved the forgotten arts of buying magazines, visiting local towns, picking up brochures, walking around electrical shops and talking to the expert salesmen there. 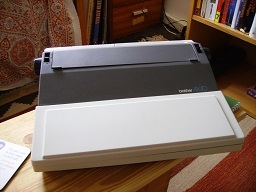 By mid-December I had come up with two potential models – the one I eventually chose was a basic no-name machine, chic in black plastic that most accurately reproduced the functions of the Ollivetti – plus, being modern, it had deletion-tape built-in. That typewriter served me well for many, many years and, in spite of the fact that I never learned to type gently, no-name was still functioning beautifully when I switched to computer word-processing in the mid-1990’s. The other potential electric model I came up with that winter was identical in functions, came in fashionable grey and taupe plastic and cost £200 more than my chosen no-name. The other potential was, of course, the Brother AX-10. So, this posting was worked up and generated using the manual typewriter method, and in terms of ease of writing it has proved thoroughly successful for me. Which just goes to show that sometimes you really do have to go backwards in order to go forward. POSTSCRIPT – the final sentence above has remained unchanged from the initial note-taking through all subsequent revisions. Some things never change. This being the season of the Wild Hunt I thought I’d post up my work on cataloguing my Skull Collection, which I am archiving in the Gallery. The first skull in my Skull Collection was a housewarming gift, left by an unidentified previous occupant, who in a pique of randomly directed maliciousness thought to curse me. Perhaps it was directed at the landlady – a plausible enough explanation, but I chose at the time to see it as my own personal gift-curse. A bit like having three wishes to bestow, except it wasn’t, it was a single dead-eyed curse.